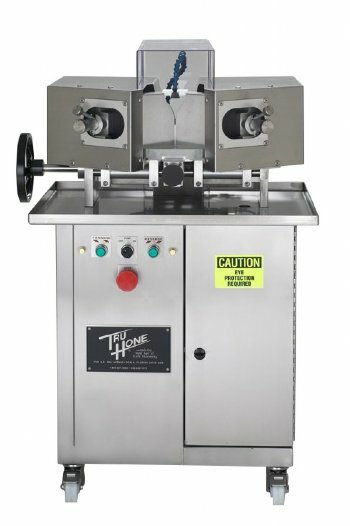 The HG3 Hollow Grinder uses two 6"(15.25cm) cupped grinding wheels mounted on 1 HP stainless steel motors to simultaneously taper grind both sides of a knife blade. Thick knives are quickly thinned and restored to almost new condition. The benefits of properly tapered knives for a processing plant are increased production and yield while reducing costly injuries from dull, inefficient knives. Semi-automatic diamond wheel dressers allow both grinding wheels to be dressed in less than a minute. A self contained coolant system keeps knife blades cool during hollow grinding. Built for years of service, the HG3 comes with a one year warranty. Click here for more details.